There are times when you have to separate the real man from the man on the silver screen. A number of actors who have such a persona and strong pedigree that you simply have to forgive them (or forget) that there is even a real person behind it. Tom Cruise and John Wayne are two legends that fall into this category. Both of these guys get right under my skin when I see TV interviews or read their views on various issues. But I can divorce myself from this and not let this bleed into what they do best, which is to entertain and draw us into a world of make believe. I grew up on The Duke. It was a movie genre I bonded with my father over and every time Wayne came riding on to the screen, I knew we were in for a good father-son couple of hours where I could look up to men that inspired a better world. From the 1960s onwards, Wayne did a number of excellent movies that I am sure will feature in this movie-a-day series I am embarking on at this precise moment. So please forgive a sentimental reviewer. 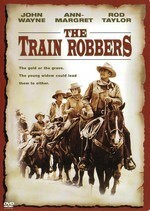 For the time being, let us focus on one of the later ones in his life, The Train Robbers. Here we have the Duke undertaking the head of the gang of guns that are out to recover the gold of a robbery so the widow may start her life, with her morality balance back in sync. The widow in this particularly instance is no stranger to regular readers, the delightful and forever beautiful and sensual, Ann-Margret. In fact here her sexuality is built in, with the Duke asking her to try on clothes, then offering to boil her top so it may shrink so it can have all her curves stick out in the right places. He wants to make sure that any one riding from afar is under no mistake that the widow is still with them and not told them where the gold is. Regular Duke fans will no doubt recognize Ben Johnson who is once again seen riding side-by-side as his trusted right hand man. 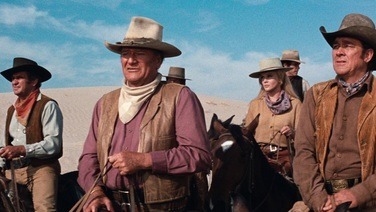 You don’t go into a John Wayne movie expecting a huge complicated story line. What you are buying into, is basically the same story, the patriarch (the Duke) who is all knowing and all wise who knows precisely what needs to be done when and just like Steven Segal and Jason Statham, is rarely rarely seen getting an on-screen kicking. The Train Robbers does not disappoint on this score. Speaking of scores, the movie has the classic big western orchestral soundtrack. However in this instance, keep an ear out for how it changes when the bad guys are on screen versus when the good guys are on screen. It is a wonderful audible cue as to what you should be feeling. There is a great twist at the end of the movie that has you smiling. If you are a fan of the simple 1960s/1970s westerns then this movie will not disappoint you. It is the perfect Saturday/Sunday afternoon movie that you would have normally stumbled upon on the BBC, that draws you in for the full run. Treat yourself, escape into a world of when men where men, and horses were scared!